Water, Cocoa Pod Ashes, Plantain Skins Ashes, Palm Oil. This is THE STUFF. 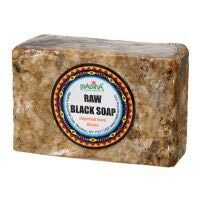 I don't use this brand, but a very similar looking raw, African black soap. I did not know about this product until a few friends recommended it to me. I was reluctant to try it because of how it looked, but I have it a shot and I've been hooked for almost a year now. It's the only thing that helps my acne. It smells clean and lathers nicely, and leaves me without any oil at first. I started to see results within the first week of use. Works wonders on body acne as well. I will say, DO NOT use this if you have dry skin, or in fact, anything less than an oil slick complexion. Its a very pH basic soap. It's meant to be paired with African shea butter -- I sometimes use the SheaMoisture brand at night, but for the day I like a water-based gel moisturizer. Last point is that this is, in its proper form, all natural, which seems best for my sensitive skin. Please give this a shot if you haven't already.